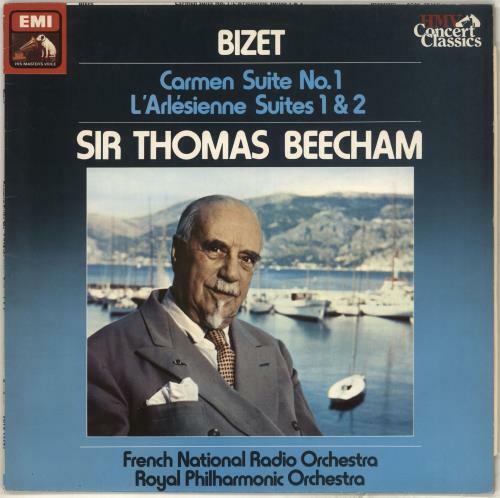 FRENCH NATIONAL RADIO & ROYAL PHILHARMONIC ORCHESTRAS conducted by SIR THOMAS BEECHAM Carmen Suite No. 1 / L'Arlésienne Suites 1 & 2 (1979 UK stereo LP issue of the 1960 performence of Carmen with The French National Radio Orchestra & the 1967performance of L'Arlésienne with The Royal Philharmonic Orchestra, both conducted by Sir Thomas Beecham, picture sleeve. Then sleeve shows just a little light shelfwear with a bit of edge scuffing and the vinyl remains in excellent conditionwith few signs of play SXLP30276). or visit our Georges Bizet image gallery.